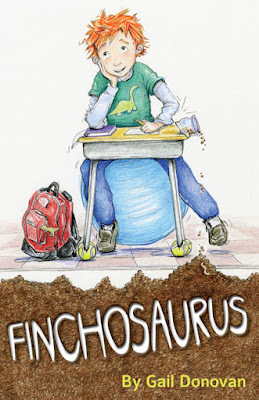 One lucky commentor will win a copy of Gail Donovan's new middle-grade novel, Finchosaurus! JULIA SPENCER-FLEMING: It's that time of year, and you need a Christmas gift or Hanukkah present for your child/grandkid/nephew/bff's sweet girl. I'm here to steer you right, by pointing you toward Gail Donovan's books. 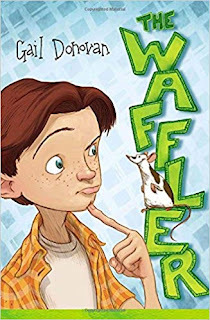 Gail is the critically acclaimed, bestselling author of In Memory of Gorfman T. Frog, What's Bugging Bailey Blecker, The Waffler, and her latest, Finchosaurus. Gail writes for middle grade readers, that sometimes hard-to-please group between 7 and 12. I can personally attest to her powers, as she was one of Youngest's favorite authors when she was in that are range. However, Gail shares something in common with those of us who write for tiny tots, teens, or adults - finding The Idea; the one good enough to stake an entire book on. With my newest middle-grade novel, Finchosaurus, just published, it’s time for me to start something new. Way past time. Unfortunately, I’m not the sort of writer with more ideas than I have time to execute. If you’re one of those people, I hate you. Just kidding. But I am jealous. Because my idea-creation mode is more the “pulling teeth” variety. That’s why I wasn’t about to let an idea escape, one recent night. I’d been trying to come up with a new character, but she wasn’t fully formed. So I set myself the task of thinking about her while I slept, hoping my nighttime brain could do what my daytime brain hadn’t. Hoping I would wake in the morning with an idea. I woke up only a couple of hours later. Maybe the cat was making her weird “let me out” noises. But for whatever reason, I was awake, and I did have an idea. Good, I thought, I’ll write that down in the morning, and I drifted back to sleep. I woke again. Same idea, with another twist. That could work, I thought, and went back to sleep. For the third time, I woke up. My brain: Do Not Forget. There’s the girl, there’s the twist. Me: Yes, I promise I’ll remember. Back to sleep, but not for long. Soon I was awake for the fourth time, knowing there was no way out: I had given my brain a job and my brain had done the job. Now it wouldn’t let me go back to sleep. Resigned, I got out of bed. Unfortunately, I seemed to have shed my pajamas during the night. I was stark naked. I wanted to get the idea down on paper. I did not want to wake up any more than I had to by doing things like getting dressed, or turning on the lights, especially because the blinds were up, and we live in the city. That’s how I came to find myself crouching on the kitchen floor, scribbling notes by the light of the open fridge door. Writing just enough to convince my brain that it could let me sleep now. I don’t know if this idea will turn into a book, but I hope so. Because this character has persistence! She woke me up four times to say, Write about me! So, I’ll try. After all, it’s not every day—or night—I get an idea. Finch has trouble paying attention in school. He’s just too busy dreaming about uncovering a dinosaur fossil and naming a new species after himself—until he digs up a note in his fifth-grade class garden with the word HELP on it. He is determined to come to the aid of the mystery note-writer. But when the quest turns out to be harder than expected, Finch risks losing two things really important to him —his best friend Noah, and a field trip to Dinosaur State Park. 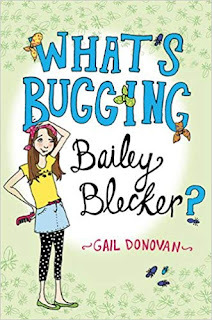 Acclaimed author Gail Donovan gets inside the hearts and minds of fifth graders on this journey told with unexpected humor and impressive insight. 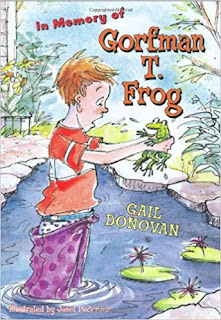 Gail Donovan is the author of middle-grade novels, including the recent release Finchosaurus and In Memory of Gorfman T. Frog, named to the New York Public Library 100 Books for Reading and Sharing list. She is also an author for the Rainbow Fish & Friends picture book series based on the bestselling books of Marcus Pfister. She is a Chicago Tribune Nelson Algren Award finalist and a PEN/New England Discovery. 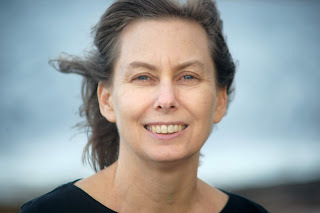 Donovan lives on the coast of Maine with her husband and two daughters, where, in addition to writing children’s books, she is a library assistant at the Portland Public Library. Congratulations on your new book, Gail. Do you have a “favorite” story or character? Have you considered turning one of your characters into the star of a middle grade series ? Or do you prefer to focus on a new character for each book? I've often wished I could write a series because kids love them, parents love them, and I love to read them, too. But my ideas are for stand-alone novels, so I try to accept that that's the kind of writer I am. After all, when I was a young person wanting to be a writer, I would have been THRILLED to know I could write even one book. These books sound delightful, Gail! I will check them out for my nine-year-old friend. Glad the story came knocking at your brain - and was persistent enough for you not to give up. I love children's books! From the cover art to the characters situations and their simply yet wonderful look at life. These books, I am sad to say, I have not read. I must do so immediately! Julia, you are a hoot! I hope you like them, Deb. I agree that Julia is a hoot. I'm intrigued by your books. I'll ask my 11 and 13 year old buddies next door if they've read them. Good morning, Margaret. Thanks for your interest! Love your blog Gail, and completely understand the importance of grasping the elusive idea when it comes! the covers are beautiful--do you have any say-so with those? Hi Lucy! I don't have any say, but so far I've been lucky. For "Finchosaurus" my editor at Islandport Press, Melissa Kim, chose artist Amy Preveza, and I love what she did. Glad to meet you, Gail. That's persistence, writing by the fridge light. Did you get a snack while you were there? I would have. Ha! I often do go in search of snacks in the night, but not that time. Thanks for writing, Mary/Liz. Nice to meet you, too. Sorry to say, no middle grade readers here any more--but that won't stop me from checking out your books, Gail! A good story is a good story! And I hear you on trying to do something in the middle of the night, but not wake up so much you can't get back to sleep--but crouching naked by the light of the fridge sort of tops any tale I could tell! Best of luck with your new idea and with Finch! Hi Flora, I agree, a good story is a good story. I hope you enjoy mine, if you do check them out. Thanks for commenting! Gail, that book is bound to be a winner! Good for you in not letting the ideas get away. I know exactly what it is like to think of something in the middle of the night, swear to myself I will remember, and then of course it is gone when I wake up. I also fully understand about your not wanting to turn on lights, naked or not. I keep a flashlight by my bed but it is only ever used when my granddaughter sleeps over - apparently she can't negotiate in the dark like I can. Hi Judi, I am definitely finding more and more that things not written down just disappear--thus the sense of urgency. A granddaughter sleepover sounds like fun. Is she the right age for "Finchosaurus"? It's for 8-12 year old readers, but also for younger kids who like listening to chapter books. Thanks, Gail. Sleepovers with GD are so much fun! She tells me all sorts of things in the dark that she probably would never tell me face to face in the daytime. But she'll be 15 tomorrow and is reading more mature books. Although I am thinking of them for her younger brother - I think he's almost old enough for them. Congratulations on your new release! This book sounds perfect for my grandson who reads like a 10 year old and is advanced for his years. This book would be ideal and enjoyed greatly. Thanks for this lovely feature and giveaway. Thanks! I'll post the winner tomorrow. I buy books for my grandchildren who are avid readers. This one is definitely something which they would all love. I am now going to be on the lookout for your books which I can add to their collection. Best wishes. Thanks for writing, Petite. So glad to hear your grandchildren are readers. This is so great, Gail! It is so fascinating how our good ideas deal with us… And I just have to laugh at you arguing with your brain, saying: really, I’ll remember, just let me sleep! I found sometimes if I say it out loud, then I’ll remember. But who wants to take that chance? And if you write it down, still sleepy, it’s never quite right. But worst of all is the haunting realization that you thought of something and went back to sleep. So hooray, I picture you by the light of the refrigerator… Congratulations! Yes, the night-time brain must be obeyed! Thanks for writing, Great Aunt Deb. Gail, welcome to Jungle Reds! Julia, thank you for introducing me to a new author. I'm adding Gail's books to my shopping list. Love the tradition of giving books as Christmas gifts. Thank you, Diana, I'm happy to be visiting on Jungle Reds. And thanks for adding me to your shopping list! Gail, what a fun post! I've obeyed the middle of the night brain, but never by the light of the fridge! What age are your picture books aimed for? My granddaughter is coming up on three, so we've got a ways to go before middle grade--although time is really flying! Your books look wonderful and I love the covers. Thanks, Deborah! My picture books are for 2-5 year olds, so that could be just right. Gail, I just love the mental pic of you writing by fridge light. What an image. I was sad when my grandsons grew out of your books as I think they are brilliant. So glad Julia asked you to contribute. Hi Celia! I'm glad you enjoyed this little piece, and glad we get to call Julia a friend, too. Very happy my nephews are the right age for this. Already sent and ready for Christmas. Loved your launch party, too, with the T Rex theme. I look forward to watching the process for your new protagonist. Hi, Shari. Thanks again for coming to the party and having right-aged nephews! I used to love reading children's books! No grandchildren or godchildren in that age range now, darn it! Your nighttime brain is very persistant. I didn't comment on gratitude yesterday as it's been a hellacious year. I went with my husband to the dermatologist surgeon this morning to get a spot on his face checked out. We're good to go now and I am very grateful for that. Also grateful we'll be relaxing for a few days in Key West two weeks from now. Coffee, Roberta? I hope you have a nice time in Key West, Pat. So glad you're here today, Gail, as I have a nine-year-old granddaughter who is a voracious reader, and I'm always looking for new books for her. I'll be checking out these middle grade books of yours for sure. Thanks. Hi Kathy. I'm past 9 year old kids and before grandchildren, so I'm a bit jealous! Today I got to visit a library book group of 8-10 year olds and it was marvelous. Thanks for commenting. The description of writing by refrigerator light is brilliant! And tells me how truly creative you are, Gail. Gail, your book sounds like so much fun! I don't think there were 'middle-grade novels' when I was growing up. So I'm imagining you naked on your kitchen floor, writing with the refrigerator door open. IT'S COLD! Thanks, Hallie! I tried to keep that nighttime writing episode as brief as possible. For my daytime writing, I wear clothes and try to be in a clean and WARM, well-lighted place. Writing by fridge light - that is hilarious! I think you must have a winner here, Gail. Congratulations! I love the particular age that you write for - kids just feeling out their independence but still kids at heart. In fact, I miss that age. Congratulations on your new release. I know just who to buy it for! Happy Holidays! It's a wonderful age, isn't it? In between toddlers and teens. Thanks for writing and Happy Holidays to you, too. Congratulations on your book! I am a special education teacher and I love fun children's books! Wishing you Happy Holidays!! Thank you for the important work you do as a special education teacher! And the winner is... No. I had so much fun at Jungle Red Writers I decided to pick 2 winners! Let's make that, the WINNERS ARE... "traveler" and "Kathy Reel." Please go to www.gaildonovan.com where you can find my contact information. Send me your mailing address and I'll send you your copy of Finchosaurus!